Garron Point, Co.Antrim, exposes members from the Ballintoy Chalk to the Portrush Chalk; just above wall is Altachuile Breccia, succeeded by Glenarm Chalk, then Garron Chalk (with large flints); Portrush Chalk occurs below the Tertiary lavas. 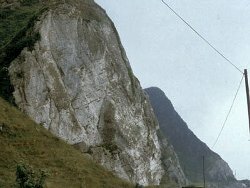 The Cretaceous chalk in Northern Ireland, perhaps better known as the Ulster White Limestone Formation, is extensively developed around the coastlines of Co. Antrim and Co. Londonderry. There are fourteen named members in the formation and all can be seen along the Antrim Coast Road between Garron Point and Cloghastucan but because this area contains the stratotypes (see glossary) of the Galboly Chalk Formation near the base of the succession and the Garron Chalk Formation near the middle, these are the main subject of this entry. This section of coastline is littered with loose and tumbled boulders and some more coherent masses of chalk because the entire cliff line backing the coast road is rendered unstable by a largely unseen layer of Lower Lias (early Jurassic) clay. The load of basalt and chalk above squeezes out the clay along its free edge, resulting in subsidence and collapse. The stratotypes of both formations lie in this zone of instability. The type section of the Galboly Chalk Member takes the form of a pillar poised above the coast road on the inland side. It is a familiar landmark in the area, known as the White Lady. At 5.85m, it is the thickest local development of the member. The base is not seen in the pillar but is exposed on the foreshore as a creamy limestone with dark, lime mud partings. Glauconite (a complex, dark green mica mineral indicating marine conditions) grains tend to concentrate around these levels. Incipient flint nodules occur 60-90cm above this level but black flints take over 70cm above them. Over the next 2m there are six distinct flint bands, forming a good marker horizon. This is followed by a heavily weathered level, topped by a further 2.2m sequence, again with six flint bands, which ends at an erosion surface at the top of the pillar with a scattering of flints. Fossils are rare but include belemnites, sea lily plates of the genus Uintacrinus (the zonal fossil) and species of sea urchins differentiated by subtle shape differences, useful for dating. The stratotype of the Garron Chalk Member occurs further east, in the cliff section just north of the Post Office at Garron Point. It consists of three beds. The lowest is 2.3m thick, recognised by its massive, purple-tinged flints. A prominent bedding plane marks its upper limit. The middle bed is 3.7m thick and commences above the bedding plane with tabular flints, followed by a flintless chalk but is easily recognised by the belt of scattered giant flints in its middle. The bed terminates at a level of small nodular flints above another flint-free section. The top bed is 3.55m thick and commences with a belt of giant flints, followed by wavy sediments and topped by small, nodular flints immediately below its termination at a bedding plane. At the time when the Galboly Chalk oozes were settling on to the sea bed, there were two basins in the area separated by a finger of Dalradian rocks, the south-western extension of the Highland Border Ridge. This ridge, 10-15km wide at the time, extended from Fairhead into Co. Londonderry and Co. Tyrone, creating the Rathlin Basin to the north west and the Larne – Lough Neagh Basin in the south east. The Galboly Chalk is found in both and appears to have been deposited in both at the same time. Differences in flint patterns and the existence of green pebble bands reflect times of little or no deposition in some areas. These differences have formed an area of research showing relative rates of subsidence across both basins. The Garron Chalk was formed after the ridge was inundated by the sea; it is thicker on the Rathlin Basin side, suggesting that conditions further south were more stable. These events happened between 85 and 80 million years ago, when the map of the world was beginning to resemble that of the present day (although Greenland had yet to detach from America and Europe). Stratotypes are essential reference points in the understanding of geological history and both of these must therefore be protected and preserved. The White Lady is precariously poised and could, potentially, fall victim to gravity (the area is still actively slipping) or road widening. Its landmark status, added to its geological importance, ought to secure it from future development.